McDonald's is not somewhere I would usually go for a snack. But, sometimes, you are stuck. 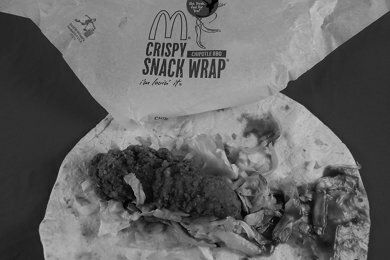 Because I write about snacks, I was curious about the McDonald's Snack Wrap and I was hopeful that it was a healthier alternative to their usual menu. Well, I purchased the Chipotle Barbeque Snack Wrap (crispy) because it sounded great! I love Chipotle sauce and I love crispy. But, since I had to report on my findings, I asked for something that is really no fun. I asked for the nutrition facts for the food I was about to consume. If you want a buzz kill - go ahead and ask for the nutritional facts at any chain restaurant. I have done this a couple times - at Chili's for example - and have been blown away by the calorie content of the food. 330 calories and 15 grams of fat later, I was feeling bad. The first thing is that the wrap consists of a soggy tortilla, measly lettuce, and a sprinkle of tasteless cheese. The chicken was deep fried and tasty and the BBQ sauce was sweet and tangy. The combination was pretty awful except for the Chipotle taste. The Small Hamburger at McDonald's only has 250 calories! Of course, it is snack sized compared the Quarter Pounder. You can get a grilled Snack Wrap option that sets you back around 260 calories - same as a Doughnut and pretty similar in terms of nutritional content. A review of the list of nutrition facts led to only two snacks below 200 calories - the Fruit 'n Yogurt Parfait (160) and the Vanilla Reduced Fat Ice Cream Cone (150). You can also get a salad without cheese, chicken, and dressing and get below 200 calories. What did I learn? If you go to a chain - ask for the nutritional facts - BEFORE you order. The information will help you choose something that makes sense for your waistline. How do you deal with fast food venues? Please share! Subway Veggie Delight with no cheese or sauce rocks! Otherwise, anything grilled--avoid crispy, unless it's an apple! Just a couple thoughts...I am wondering....if you are trying to snack healthy, why would you order the crispy instead of grilled? The honey mustard grilled snack wrap is only 260 calories and 9 grams of fat, rather than the 15 you were complaining of. Also, I find it ironic that you then suggest the hamburger since it is only 250 calories, when in another post you tell how truly terrible it is. Doesn't really make sense to me? I agree...McDonald's is never going to be the healthiest choice, but I think you can choose wisely from the options available. I occasionally stop at Subway, order the kids meal- a small wheat roll with whatever you want, I get vegetable, black olives and mustard and also a small drink and apples- that are presliced packaged. Not a bad deal for 5.00. Also when I go to Panera, I ask for my apple sliced and in a to go cup and I add fresh lemon at the drink station so I can enjoy it later. Does anyone have to go to a deadly fast food joint? I have not been in one for at least ten years. I take my lunch to work, cook quick and easy dinners. Always look at the restaurants nutrition info on their web sites before I go. Mostly this has led me to not go there, I have one favorite place since I was a child, and that is Denny's, they have healthy food items that are healthy and priced right. On occasion I go to a upscale place but really I no longer enjoy them, few things on the menu that I am willing to eat. I also like Subway's all veggie sub.